We have come up with a list of best smart and non-smart 32 inches LED TVs under 20000 for our users. The price of the listed LED TVs is between Rs 15000 and 20000. There are a ton of options available online so we have tried to make your life easier by listing only the best ones. LED TVs are selected from major brands like LG, Samsung, Kodak, VU, and Mitashi. All of them have a solid build with great picture quality. Televisions from smaller brands like VU, Kodak are priced around 15000 and TVs from bigger brands like LG and Samsung are priced around 20000. If you are on a tight budget, you can go for VU and Kodak without worrying too much. Both of these brands make high-quality tvs at affordable prices. Mi TV 4A is another great option under 15000. All these 32 inch LED TVs have great display panels which offer good clarity, sharpness, and contrast. For audio, you will find dual speakers on most of the televisions which create and immersive watching experience. The TVs which are non-smart can be linked to WIFI by using devices like Google Chromecast and Amazon Fire Stick which plugs into the HDMI port of the television. Let's take a look at smart and non-smart best 32 inch LED TVs under 20000. Mi had earlier launched MI SMART TV 4A which was a Flipkart exclusive LED and available at a price of under 14k which saw a great user response and MI sold around 10 Lakhs unit. This is the 2nd MI LED TV with a 32-inch display known as the Mi LED TV 4C PRO which comes with some improvements in software and features over the earlier version. It is an Amazon exclusive television and is available at a price of around 14k. This 32 inch LED TV had an HD resolution with decent viewing angles and good color reproduction. The design is similar to the previous 32 inches MI LED having thin bezels all around. But what's new in the Pro TV is that it comes with Google Android TV support allowing you to download the compatible apps from the Google play store. This is an Android TV and is based on Android Oreo. One of the other noticeable feature added is the mic button on the remote. This mic button when pressed listens to your command and uses Google Assitant to find different content. Xiaomi had also added inbuilt Chromecast which allows you to share the content from your phone onto the TV screen. There is a Patchwall in this Pro TV series as well which allows you to bring content to the home screen and now there are 14 content partners (Hotstar, Hungama, SonyLiv are some of them). MI TV 4C PRO comes with stereo speakers with 20 W output. It has 3 HDMI and 2 USB ports to connect to multiple external peripherals. Additionally, there is a dual UI mode that allows you to choose either of the interface based on your liking. This is one of the best LED TV you can get under Rs. 15000 in India. This LED TV brings in the experience of a Curved LED TV in the budget pricing. The concept of Curved LED was started by Samsung and followed by other companies, the curved display improvises the viewing experience as it provides improved wide angle view. This 32 inch from Mitashi comes with an HD resolution display and the design is really amazing. For a pricing of under 15k, you get a smart LED TV as it has the inbuilt WiFi and you can stream videos and entertainment content using NetFlix, YouTube and other apps. This TV has 1 GB of RAM and 8 GB of internal storage and all the apps loads smoothly. This smart TV comes with 2 HDMI and 2 USB which are sufficient enough for most of the users looking to connect laptops, pen drive, setup box or gaming consoles on this TV. As in many other smart TV, you get the option of casting your mobile screen on TV or also use your smartphone as the remote using WIFI. This is a most economical curved smart TV available at a cost of less than 15000. Cloudwalker 32 inch Smart LED TV is very attractively priced at under Rs. 15000 in India. It offers excellent value for money. The display panel is of A+ grade and it is bright and sharp with good viewing angles. The display uses Xluminous Display Technology which enhances the image quality and supports both SD and HD content. It is a smart tv with inbuilt wifi and you can download and run Netflix, Hotstar or YouTube apps for watching content on TV. The audio output of this television is great. There are 2 front firing speakers which deliver a sound output of 16W. You won't feel the need to add external speakers. Also, the user interface of the television software is smooth and easy to use which gets regular software updates. Overall, we are impressed with the performance and quality of this LED TV under 15000. This Cloudwalker TV also supports Miracast technology that allows you to watch content from mobile onto TV screen via wifi. There are 1 HDMI and 2 USB ports to connect external devices like Pendrive, Laptop. This Cloudwalker LED TV is one of the best smart led tv under 15000. Onida has been in the electronics industry for years. This Onida Smart LED TV has a 32-inch display and has a good level of brightness and colour accuracy. It is inbuilt WiFi and you can download apps from the play store. It also supports Youtube and other top media content applications. The audio quality is one of the most important part of any led to being a best-led tv. this Onida smart led tv with 2 speakers with 16 W combined output, produces crisp and loud audio output. This TV also has 3 HDMI and 3 USB ports which are rarely seen more than 2onn any TV, so it can support multiple pen drive, laptop or any other external device simultaneously. Onida products are priced low compared to similar product from LG and Samsung but they have decent quality. This LED from Onida is priced below other smart tv with similar size. The only problem you will face is with after sales service. Their network is not strong so that might be an issue. Kodak is a new brand in LED TVs but they are doing very well. Kodak LED TVs are well priced and offer great value for money. This is a 32 inch Smart LED TV from Kodak. The 32 inch display is an Anti-glare Panel. The anti-glare panel reduces light and contrast. You can watch TV for hours without straining your eyes. As it is a Smart LED TV it comes with many built-in apps like YouTube and Netflix. Plus, with Wi-Fi connectivity, you can even browse the internet and stream online videos on your TV. The TV also has Miracast support with which you can mirror your smartphone screen on the TV. On the connectivity side, there are plenty of USB, HDMI and VGA ports available to connect external devices. The audio is delivered by dual speakers. The sound output is 20W and provides an immersive experience while watching movies. Overall it is one of the best 32 inch Smart LED TV under 12000 to 15000 Rs in India. Mitashi is not a very old brand but has built a decent brand value with its value for Money LED TV. This is a 32-inch smart LED TV under 20000, where the display has an HD resolution. It looks great with minimum bezels all around. This LED has a high refresh rate that ensures you would have a superb experience while watching any content. This Mitashi smart tv runs on Android Operating system and supports various apps of social media, mailing, chatting and entertainment apps like YouTube, Netflix etc. This smart tv also comes with a feature to use your mobile phone as a remote. It also has a mode where if you are listening to an audio sound and do wish to view the screen or video, then you can switch off the display with the song playing in the background. This helps save a lot of electricity consumption. Usually, Smart LED TV from LG and Samsung cost above 20000. 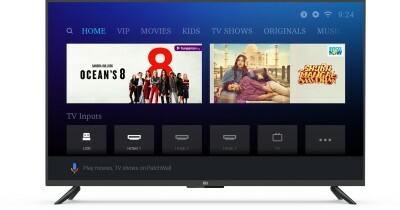 A few companies like VU, CloudWalker and Mitashi are offering smart led tv below 20000 in India. Feature Filled Smart Television under 20000. VU has strengthened its base in the LED TV segment in the last 3 years because of the wide range of tv options available at very competitive prices. This is the latest 2019 edition 32-inch smart led television from VU and is an absolute stunner if you have a budget between 10000 and 20000. It has an HD resolution and the screen looks amazing with beautiful colors and wide angle view. With the A+ grade panel, the light reflection in eliminated and improves the viewing experience. In the looks, this led tv has a minimum bezel and this TV adds beauty to your living room. It has 2 speakers that deliver good audio quality. Also, since this led is a smart tv, it supports both LAN and WiFi, and also has dedicated YouTube, Prime Video and Netflix buttons on the remote itself to quickly launch the apps. It runs on PremiumSmart OS, which in our review was easy to use and the apps loaded quickly. There are also some inbuilt games to keep you entertaining all the time. 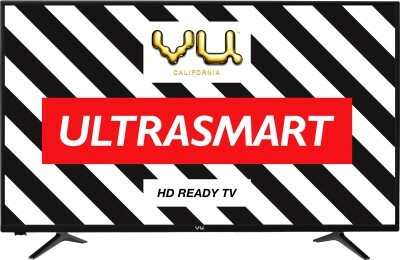 VU is offering a lot of great LED TVs at very competitive prices. This is another good Smart LED TV from VU with no major negatives. At this price, it is one of the best 32 inches Smart LED TV under 15000 in India. So this was our list of best smart and non-smart 32 inch LED TVs under Rs 20000. We hope the list was helpful and you were able to make a choice. If you need a 43 inch LED TV then we would suggest you increase your budget by around 10000.